I do not include any of the stiffener in the waist seams, either. I cut it to just below the waist seam. 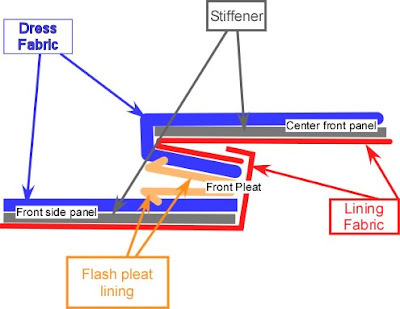 Placement of stiffener: I do not use stiffener in my back skirt. The fabric has some stiffness due to the fact it has been stabilized, but I have only ever stiffened the back skirt once because it kept collapsing (another construction error on my part). For the CFP and 2 FSPs, I make pockets in the lined skirt pieces and insert the cut stiffener. The CFP is a complete pocket made by sewing 2 lines from the hem to 2 inches below the selvedge at the waist, through the lining just to the side of the flash pleat color. I roll up the Firmflex and put it through the top, work it into place, give it a good shake, and it is in to stay. For the FSP, I sew 1 line from hem to the waist selvedge this time, on what will be where the FSP folds back into the side pleat/tuck. I insert the cut piece which extends from the fold line all the way to the pleat edge. This I either fuse into place with a bit of WonderUnder or with some Fabri-tac. The above is what I do when I have a regular hem on the skirt. When I am going to satin-stitch the hem, I still make the pockets, but there is no hem. This makes it easier to insert the FirmFlex into the CFP as I do it from the bottom. For both the CFP and the FSPs, I make sure it is fused to the fabric about 1/8″ below the waist seam line, but I do not worry about cutting the hem line exactly. I leave the stiffener longer so I can easily & smoothly fuse the base and lining fabrics into place. Next, I run a stitch along the hem line (shaped or unshaped)to secure it all, then trim the hem neatly, and I am ready to satin-stitch. Hi, I have a lot of experience in dress making and making of historic costume but this is the first time I make an ID dress. Could you please identify what you mean by “stiffener” and “satbilizer”, I mean the commercial names in english. After reading your blog and a few others, I am confused between Timtex, Wonderunder, Fabri-Solvy Soluble Stabilizer and Sticky Self-Adhesive Tear-Away Stabilizer. I will be looking forwards to your reply.